Section, Australia). She started talking about the vast amount of information that isn't found by search engines. It is a dynamic information lanscape and can make information decontextualised, so that there are problems along with the many benefits and convenience of online information.Coombs highlighted the multipliocity of apps and technologies available.However, many people do not have physical or cognitive access to the web. Cognitive access means not being able to read or interpret the information, even if you physically have access. Coombs went on to consider the word literacy. She wondered - had it been hijacked, when it has been tacked on to so many other words? She posed the question whether competency, rather than literacy, was meant. She showed some definitions of literacy that included critical thinking and reading, learning, and also being actively literate (e.g. "purposeful" reading). Thus it was more than just being able to read, and including understanding and reusing. 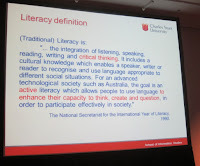 Turning to digital literacy, she saw it as including computer and ICT literacy, Web 2.0 literacy, network/internet literacy (including "knowing where you are" on the internet), multimedia literacy and information management. However she also saw digital literacy as about ethical use of information, cultural awareness, access for the disabled, privacy and safety, and applying information to your lives. Thus digital literacy was a complex and evolving concept, and it was affected not just by technology but by the people developing and using technology. A prerequisite is literacy: being able to read, write and understand. 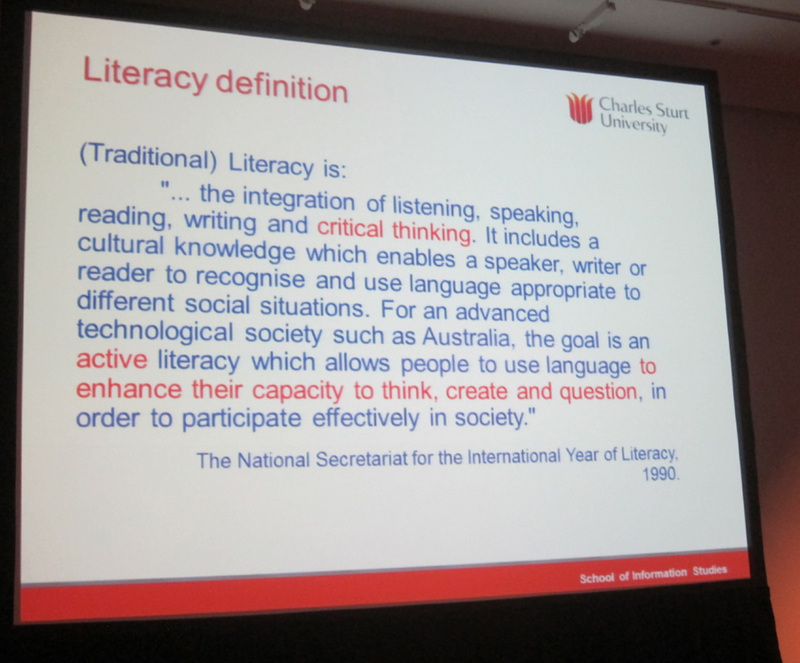 Coombs concluded that although "literacy" did mean competency in the context of digital literacy, it was important to think about the deeper aspects.